Frame bushing washer repair kit. They are made of U.S. mild steel. This is a must when doing a frame off restoration. After 20 years of body flex & bushings coming loose the frame mounts rust & become egged out. 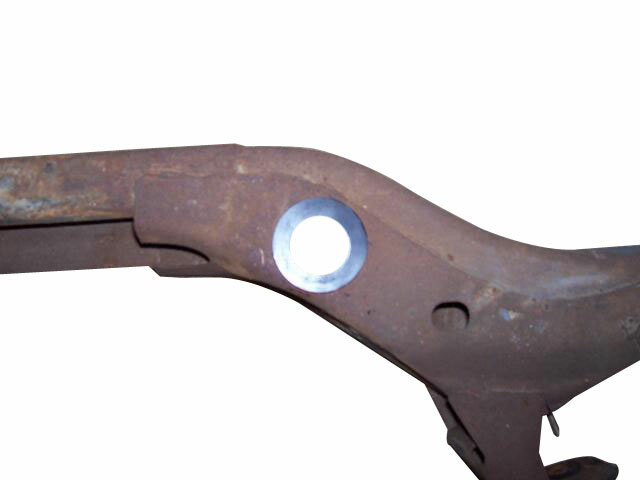 You can weld them into your frame after it is blasted or slide in the washer & install a new bushing. Tighten down & you are back to new again. If you have a daily diver & the bushings are falling through the frame this is also an easy repair. The steel is twice as thick as your frame! The new bushings also no longer are available with the little lock in dimple. Simply unbolt the bushing from the body. Never worry about your the factory bushings again. Note- We reccomend this kit be installed by a qualified body shop since it involves lifting your body off the frame. This will also assure you of getting your body back on the frame perfectly straight. We carry Frame repair washers,Factory washers & body bolts now for our kits. We recomend removing the body first to get an accurate count on other items. When doing a frame off we have everything required to replace verything. Check our site for emergency brake line cables,Fuel lines & brake lines stainless & oem. Don't see it please ask! What a great purchase! Saved me a ton of time. I can't belie ..